I wish Mummy would bring something like that back from the shops! Wow, what a fun bag to climb in. Our staff saw a kitty on a commercial that looks kind of like you Samson. We can't remember what commercial it was, but there was a photo of a kitty in it, and it looked like you. Are you on TV now? That looks like fun Samson! But aren't you afraid someone will pounce on the bag? Hey--I saw that commerical too, with the picture of a kitty that looked like you too, Samson! I think it was for Pledge? Are you a TV star too--just like you look great in that sack???? That looks like a great bag to play with, Samson! And you even have your plague rat with you - great idea to have another toy too, while you play in the bag! You're such a smart kitty. Hey Samson, looks like you and the plague ratsie have got it in the bag!! What a wonderful sack! Ours aren't nearly so pretty. Be careful, my bro got caught in the handles of one of those kind of sacks and ran through the house looking like he had a parachute behind him! Mom was afraid he'd get hurt before she could catch him...I just laughed. BBBAAAGGGSSSSS! Need we say more? That is a great bag. 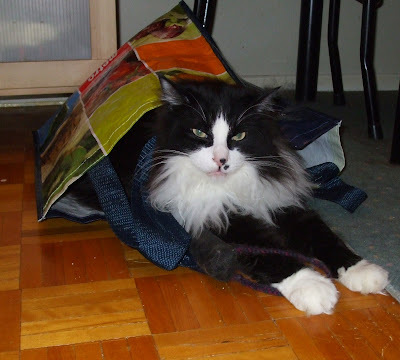 You look very handsome in that bag, Samson! It also looks like it's strong enough to withstand tortie attack - good choice! Wow that is a perfect cat bag! And the colors go so nice with your furs! Isthat a hint? Do we need some ham? We love it when Mom leaves bags laying about....aren't they fun??? Our mommy wants to know where we can go to get a bag full of Samson! He's just so handsome! She also wants to let you know the box isn't here yet but she'll let you know as soon as it is. Samson, you look adorable and we never noticed your cute white paws before. Going inside a shopping bag looks fun. I love that shot !! 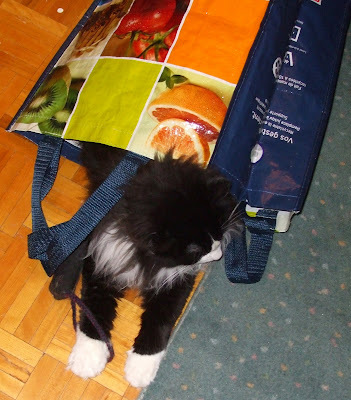 Oh, what a stylish bag you've got there, Samson! Samson looks like a very purrudent shoppurr! He even uses the recyclable bags -- what a good boy!